Tapeworms, also referred to as cestodes, are flat, ribbon-shaped, segmented intestinal worms belonging to the cestode family. They are commonly found in the intestinal tract of backyard or free range chickens worldwide. Unlike roundworms that live freely in the intestinal tract, tapeworms anchor themselves into to the wall of the small intestine using hook-like mouthparts. Tapeworms won't actually cause physical damage to the intestinal wall, however by taking all the nutrients away from the bird, it is still damaging to their health, resulting in stunted growth/weight loss, nutrition deficiencies, and increased risk of infection or disease. Tapeworms have an indirect life cycle. They use arthropods and other invertebrates as intermediate hosts (snails, slugs, beetles, grasshoppers, mini-wisps, ants, earthworms, termites, and houseflies). Chickens become infected by eating the intermediate host. Once the host is consumed by the chicken, the tapeworm larvae that was initially contained within its host gets released, into the chicken's gastrointestinal system. From there, the tapeworm larvae attach themselves to the intestinal wall, where they continuously absorb nutrients from food eaten by the chicken, instead of the chicken absorbing it. 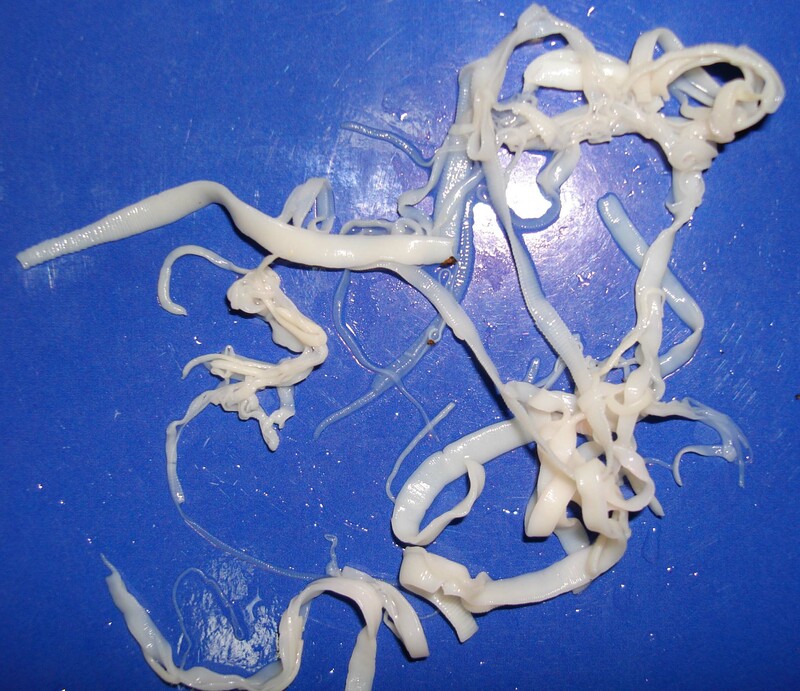 Once the tapeworm has matured into an adult, it sloughs off part of it's segments which also contain eggs, which gets passed out of the intestines and into the chicken's feces and contaminating the surrounding environment. Intermediate hosts will consume the sloughed tapeworm and its eggs, where the eggs will grow into larvae, and the cycle repeats itself. Clean bird feces from the environment regularly, do not allow a build up of droppings. Chickens that regularly consume earthworms, beetles, ants, snails, slugs, grasshoppers, cockroaches, termites or houseflies.